As an integral member of the pharmaceutical team, the Pharmacy Specialist, under the direction of a pharmacist, prepares and dispenses prescribed drugs and medicines, while also maintaining pharmacy supplies and records. The Pharmacy Specialist is primarily responsible for preparing, controlling and issuing pharmaceutical products and supervising pharmacy activities. Prepares, controls, and issues pharmaceutical products. 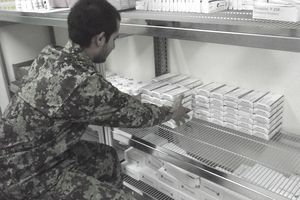 Prescription handling and dispensing: under close supervision, manually or using a computerized system: receives, interprets, compounds, manufactures, files, labels, issues and files prescriptions, bulk drug, sterile product and/or unit dose orders. Evaluates orders to verify dosage, dosage regimen and quantity to be dispensed. Checks for completeness and correctness and for common interactions, incompatibilities, and availability. Refers questionable orders or questions on the basic formulation to supervisor for clarification. Reduces or enlarges formulas, as required. Calculates and annotates proper dosage. Evaluates completed orders to ensure the integrity of the final product. Provides information regarding availability, strength, and composition of medications to physicians or pharmacists. Verifies patient eligibility for receipt of medication. Provides instructions to patients regarding medication consumption and side effects. Performs quality control checks on medications. Issues medications to patients, wards, clinics, and other using agencies. Supply, administration, and maintenance: assigns and records prescription numbers. Delivers unit doses, sterile products, bulk drug, and controlled drug orders. Prepares prescription labels and affixes auxiliary labels. Maintains signature cards and prescription files. Prepares and maintains files of controlled substances stock cards, records, and work units. Maintains master formula record, batch sheet, and patient medication record. Maintains pharmacy reference files and publication library. Prepares and files pharmaceutical reports. Prepares requisitions for and receives, packs, unpacks, stores, safeguards, and accounts for inventories. Controls and issues pharmaceuticals and pharmacy supplies. Inspects, calibrates, operates and performs preventive maintenance on common pharmaceutical manufacturing and packaging equipment. Cleans and disinfects pharmacy equipment and work areas. Packs, unpacks, loads and unloads equipment and assists in setting up unit equipment.